To access your synchronized files, navigate to the Thru folder that is located in the Favorites section of your desktop file system. Any actions made to content within these folders will automatically be synced for anyone that shares these folders on the Thru Server. 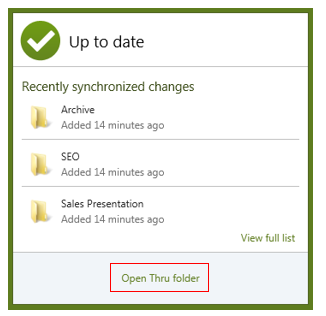 Another way to navigate to the Thru folder is by clicking on the Open Thru folder button found in the sync dashboard.